The Variable speed drive SD700 Compact series with a power density up to 800kW/m3 is the logical solution where limited space is available. 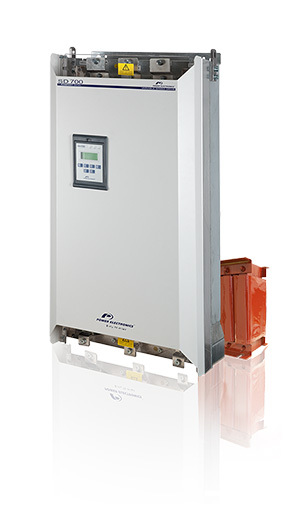 The SD700K variable speed drive keeps the advanced family features of the SD700 range but reduces the size by up to 2.5 times. This product is suitable for professional project engineers to achieve freedom and competitiveness within their own electrical projects. Copying the contactors wiring concept, it has a top input power and a bottom output motor cable. It is delivered in two IP00 pieces, the drive unit and the input chokes. The customer, following Power Electronics recommendations, will easily be able to install the components in a dedicated cabinet or technical room. Power range from 63kW to 800kW. Where a high number of motors exist, this is a perfect space saving solution. Wide voltage range (230Vac, 380Vac-500Vac, 525Vac and 690Vac). Suitable for weak electrical grids and places with variable voltage range operations. The SD700K will keep on running! Optional IP20 improvement through its dedicated enclosures suitable for technical room installation. Reduce the THD level without modifying the space needs; SD700 kompakt is available with 12 pulses. External input chokes (3% impedance), EMC input filter as standard to keep the family performance features. External braking units. When the drive absorbs the regenerated energy during braking cycles, the B150 accessory will dissipate the force.